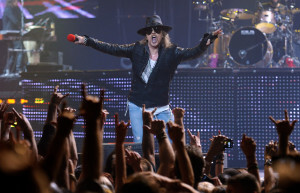 Guns N’ Roses In 3D In Las Vegas - Rock Fuel Media Inc. The current version of Guns N’ Roses (Axl and his new line-up) may be done with their Las Vegas residency at the Joint, but you’ll soon be able to watch one of their shows over and over and over again. They filmed their Wednesday November 21st show in 3D! No word yet on when or how the video will be released but I’m looking forward to seeing the ‘Axl Dance’ in 3D!